We recently interviewed Brian Murphy, Reston Association Maintenance Director, to ask him what is involved in clearing the 55 miles of paved trails in Reston. Reston does a great job of clearing the trails shortly after any significant snowfall. The photo on the right of the RA plow was taken this afternoon. The trails had been plowed once already and this was the second pass, after the snow had stopped. 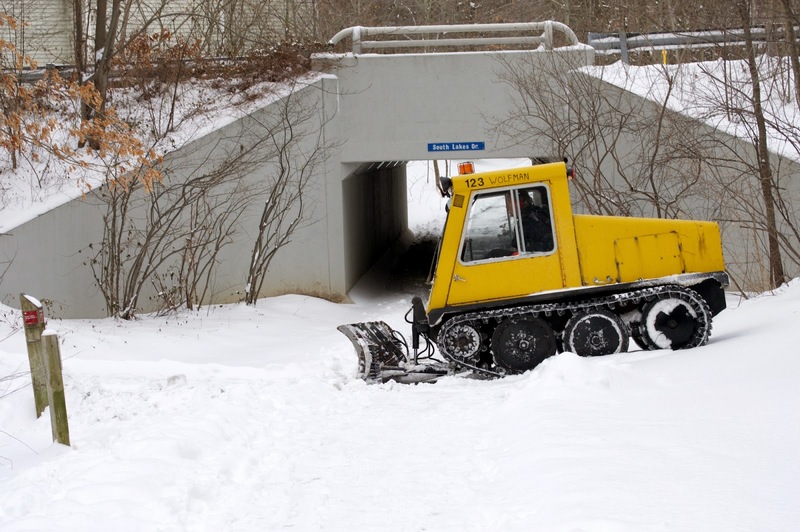 Do you have a rough estimate of the average cost/year of clearing snow form Reston's trails over the past several years? I don’t have cost for clearing the pathway since we do not budget plowing separately. We use our existing staff and since snow prevents us from doing other tasks it is a wash. The plowing involves four operators and two mechanics. The mechanics also plow the parking lots. We have three hand crews of four staff members each. The major cost is the equipment we have to purchase. What kind of plow(s) do you use and how much did they cost? They are made by Bombardier, a Canadian company. A new plow will cost about $85,000. We have always bought used plows for about $12,000 each. Three are from 1979 and one that is from 1986. How does the process work? Do you try to estimate the optimal time to plow by monitoring the weather forecast? How much snow do you need to have on the trail before you consider plowing? How do the plowing crews know where to plow? We usually start plowing at 2 inches unless they are calling for the snow to end soon. We go at 2” so we can mark the path when we get significant snowfall. If we don’t we could lose the location of the trail. We need to get more than an inch to allow us to plow. Our plow operators have years of experience so they know the pathways and you can see the edge of the pathways by a dip in the snow outlining the path. Sometimes you do leave the pathway and have to do a correction. Do you ever use salt or sand? We do use a deicer and mostly sand on parts of the system that is sidewalk or steps that we clear by hand or snow blower. Does one plow cover the entire trail system or do you use several? The pathway system is divided up into four parts and each run can take 5-6 hours depending on the snow. Do you think there is much damage to the trail related to the plowing? We do not get much asphalt damage to the trail unless we catch the edge of a patch which is rare. Do you get much positive or negative feedback about the plowing? All the feedback we get on pathway plowing is positive unless we veer off the path and have to go back and reseed areas. NVRPA has historically said they leave snow on their trails to accommodate cross country skiers. Is that a concern for you? The paths are such an important transportation route in Reston that we feel it is more important to keep them clear rather than only provide for recreation like skiers. Anything else I should know that you haven't already discussed? We actually prefer to plow at night to get to the path before too much traffic appears.